Work has started on Milton Keynes Dons' £50m 30,000-seater football stadium. 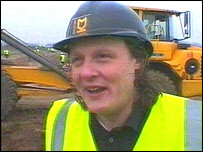 Dons' chairman Pete Winkleman, who cut the first turf at Denbigh on Thursday, said sometimes he had thought the groundbreaking day might never happen. Critics of the scheme told him he would never get League One professional football to the new town. "It's been an incredible journey - many a time when we thought we wouldn't get here but today the dream begins to turn into reality," he said. In addition to the news Dons' ground, phase one of the development will see a 5,000-seater indoor arena as well as Asda and Ikea superstores, creating an estimated 2,000 new jobs.